Lameness is a very complex and important area of equine veterinary medicine. There have been many advances in medicine in how we diagnose and treat lameness. Even with all these new tools, lameness in the horse often goes undiagnosed or underdiagnosed, particularly with respect to soft tissue injuries. Without a proper diagnosis, the ideal treatment and rehabilitation plan cannot be developed for your horse. An incomplete diagnosis can put your horse at risk for unnecessary treatments and expense, incomplete healing, and a greater risk of re-injury in the future. For example, while joint injections are an appropriate and beneficial treatment therapy in some cases, joints are frequently injected in performance horses without a full diagnostic workup.There is a growing concern among equine veterinarians that we may potentially cause injuries to soft tissues in these horses by constantly injecting their joints without identifying the basis of the lameness. Joint injections always carry a small risk of infection, which can be life threatening. Frequent, chronic use of steroids in a joint can lead to cartilage degeneration and permanent osteoarthritis. Injecting steroids into a joint that has an undiagnosed associated soft tissue injury can actually interfere with healing. Also, the steroids will decrease pain and inflammation, so the horse will feel better in the short term and go back to work. If the horse has a soft tissue injury, they will then be more likely to re-injure the area or have a severe, catastrophic injury. While you may see short term benefits from the steroids, unless medically indicated, they may be detrimental to your horse's future soundness in the long term. While it can be time consuming, allowing your veterinarian to do a complete lameness workup is in your horse's best interests. Lameness workups may include a thorough exam, flexion tests, diagnostic nerve blocks, and intra-articular anesthesia. These help the veterinarian to localize where the lameness is originating and potentially what structures are involved. A lameness exam usually begins with a visual evaluation of the horse. Your veterinarian will watch the horse move, usually at the trot, to discern the general location of lameness. They may also ask you to lunge or ride the horse. They will also look for heat, pain, or swelling by thoroughly examining and palpating the affected leg and joints. Hoof testers may be applied if indicated. Flexion tests are when specific joints are put under stress by flexing them for a short period of time and then immediately trotting the horse. When the horse trots off, if the pain originates from that joint, the lameness may be exacerbated for a short period of time after being stressed. Diagnostic nerve blocks are when the nerves that supply sensation to the leg are blocked with a small amount of local anesthetic. Any pain originating from the area can no longer be felt by the horse, so the lameness will improve once the correct area has been blocked. Often multiple nerve blocks must be performed, moving up the leg sequentially, to localize the area where the pain is originating from on the leg. Intra-articular anesthesia is similar to nerve blocks, except the local anesthetic is injected into a joint. If the joint is the cause of the lameness, the lameness should improve after being blocked. Diagnostic imaging is the next step and allows us to actually look at the structural integrity of the bones, ligaments, and tendons in the leg and determine the location, type, and severity of the injury. Images can be saved and compared to assess progress in healing throughout the rehabilitation process. Radiography and ultrasonography are the most common types of imaging. Radiography is taking radiographs or "X-rays". These allow us to look primarily at the bones, especially around joints, in the leg. Your veterinarian can see more obvious lesions, such as fractures, but also more subtle changes in the bone, such as early osteoarthritis or changes in bone density indicating that the bone is remodeling due to stress. Radiographs do not show soft tissue structures well, so ultrasound is used for these structures. 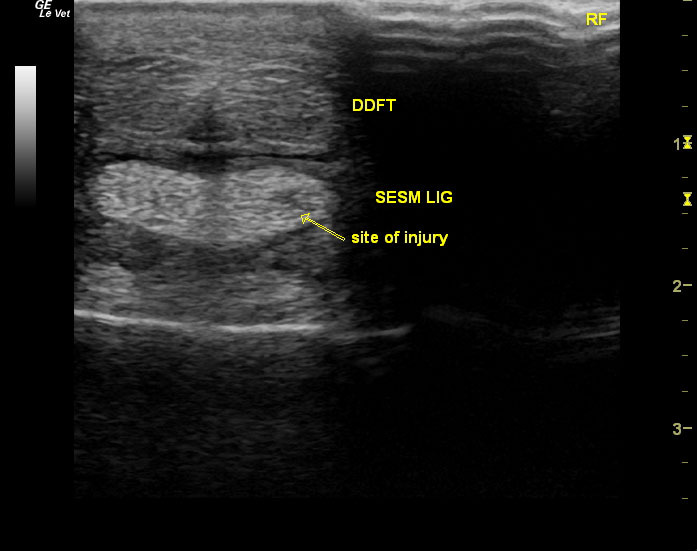 Ultrasonography sends ultrasonic sound waves through the tissue and the machine is able to interpret the returning waves to give us an image of the tissues of the leg. Ultrasound is used primarily for soft tissue structures, such as ligaments and tendons, as the sound waves cannot penetrate bone. Most frequently, strains and tears in the ligaments and tendons are diagnosed on ultrasound. It can also be used to assess the capsule, synovium, and fluid quality in joints and tendon sheaths. Many people opt to skip nerve blocks and diagnostic imaging and go straight to treatment. For example, your horse is lame and seemed a little painful when their fetlock was flexed, so the temptation is to just inject the fetlock joint. First, let's consider all the structures in this area. There is the cannon bone, long pastern bone, two sesamoid bones, fetlock joint, digital tendon sheath, extensor tendon, superficial digital flexor tendon, deep digital flexor tendon, suspensory branches, collateral ligaments, and distal sesamoidian ligaments. Any of these structures could be causing lameness and they have very different treatment plans and rehabilitation schedules. The first step toward healing is to accurately identify an injury. Once the lesion is identified, the goal of treatment and rehabilitation is to maximize healing to the extent that normal athletic activity can be resumed without re-injury. Your veterinarian may also schedule regular rechecks of the injury during the healing process. When we have not identified the cause of lameness, we frequently use a very vague rest and rehabilitation schedule. It has been demonstrated that horses undergoing a few months of stall rest followed by pasture turnout alone resulted in only 22-26% of horses returning to work for one year without re-injury. With identification of the lesion, we can structure a rest and rehabilitation program specific for the type of injury and athletic purpose of your horse. A good way to remember the minimum time of the rest and rehabilitation program should be is to use number of letters in the words BONE, TENDON, and LIGAMENT. If the injury is bone, we rest and rehabilitate for 4 months. If the injury is tendon, we rest and rehabilitate for 6 months. If the injury is ligament, we rest and rehabilitate for 8 months. While your horse may no longer be lame after just a few months, a tendon or ligament will take much longer to completely heal. It is tempting to begin riding your horse early, but being patient and allowing your horse to complete the full rehabilitation schedule will be better in the long run. The overall prognosis for return to work without re-injury after a successful completion of a controlled exercise rest and rehabilitation program has been reported to be as good as 85%. Follow this link to view or download our recommended Rehabilitation Schedule for common tendon or ligament injuries. Lastly, please consider what happens in human athletes. I asked an orthopedic surgeon in Indianapolis once why he did so many cruciate repairs in college and professional athletes and his response was quick. He said, "We don't give the minor injuries enough time to heal!" He went on to explain that too often, we strain and injure soft tissue structures, but because they are not catastrophic we continue to exercise and perform at high levels. We patch them up with drugs and different therapies, but we don't give them adequate time to heal. Eventually though, they become a catastrophic injury, that can be career ending or at least very expensive and time consuming to treat. This is what happens to our equine athletes. Just because a lameness may be subtle or responsive to minimal amounts of nonsteroidal anti-inflammatories, does not mean it is insignificant. Ignoring it and continue to work the horse can cause further damage or lead to a catastrophic injury that can keep you out of the saddle for a year or more. As a surgeon and sports medicine specialist, my specialties are identifying the root of the problem, treating the root of the problem, and rehabilitating the patient to give it its best chance for return to full athletic function. So the next time your horse is lame, consider taking a few hours and letting our veterinarians work to diagnose the cause of lameness. It might be something as subtle ligament strain, but it could be something as catastrophic as a ligament tear. We have the resources and the knowledge to give your horse the best opportunity to have a successful return to athletic function for a very long time.